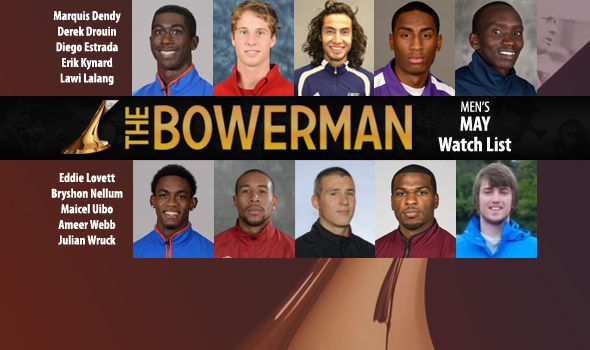 NEW ORLEANS – Three new faces join the ever-intensifying race for The Bowerman as members of the May Watch List, released Wednesday by the Watch List Committee, as the collegiate track & field world begins to gear up for conference championships. Northern Arizona distance runner Diego Estrada, USC sprinter Bryshon Nellum and Georgia decathlete Maicel Uibo each make their first appearance on the Watch List after collegiate-leading and, in the case of Estrada and Uibo, historic performances. Estrada makes his debut on the Watch List less than three days after running the second-fastest outdoor in-season 5000 at the Payton Jordan in 13:15.33, while Uibo — just a freshman — debuted at No. 8 on the all-time in-season collegiate decathlon list with a score of 8,223 in his first collegiate decathlon. Estrada and Uibo are both the second student-athletes in their respective programs’ histories to make the Watch List, Estrada joining David McNeill and Uibo joining Torrin Lawrence — both from 2010. Nellum is the first USC student-athlete to appear on the List. When last we checked on the historic high jump duel between Kansas State’s Erik Kynard and Derek Drouin of Indiana, it was Drouin who had just bettered Kynard at the Texas Relays. One month later, it is Kynard atop the collegiate leaderboard at 7-8 (2.34m), just a centimeter ahead of his Hoosier State rival’s 7-7.3/4 (2.33m). Julian Wruck of UCLA, meamwhile, has had no rival in the discus in 2013, having now recorded the top 20 collegiate throws of the outdoor season and five of the top 10 in-season collegiate marks of all time. Following a similarly historic indoor season, Arizona’s Lawi Lalang opened his outdoor campaign at the Arizona-Arizona State-Northern Arizona double dual this past weekend with victories at 1500 and 5000 meters. He makes his 14th career appearance on the Watch List, joining Liberty’s Sam Chalenga in a tie for third all time behind Jeff Demps of Florida (19) and Jeshua Anderson of Washington State (16). Should Lalang take home the Bowerman Trophy, he would become the first male with double-digit Watch List appearances to do so. Currently at eight with two editions remaining, Kynard could also achieve the feat. Marquis Dendy SO Florida Jumps Middletown, Del. Diego Estrada SR Northern Arizona Distance Salinas, Calif.
Eddie Lovett JR Florida Hurdles West Palm Beach, Fla.
Bryshon Nellum RS SR Southern California Sprints Los Angeles, Calif.
Ameer Webb SR Texas A&M Sprints Tustin, Calif. Since Last Time: Finished runner-up in the long jump and triple jump at the Arkansas Team Invitational. This Season: Has the top DI qualifying mark in the outdoor long jump at 26-9¾w (8.17m, +2.8m/s) at the Texas Relays in his 2013 outdoor debut. Won the NCAA Indoor long jump with a mark of 27-2 (8.28m), making him the sixth-best performer in collegiate history, and jumped 27-0 (8.23m) on another attempt. Finished fourth in the NCAA Indoor triple jump at 53-1¾ (16.20m). Recorded a then-collegiate-best long jump mark of 2013 with a 27-1 (8.25m) in winning the SEC Individual Championship in the event. He surpassed 27 feet twice in the competition, and recorded another just a quarter of an inch shy. He is the only collegiate jumper to surpass 27 feet this season. Since Last Time: Set the Penn Relays and Franklin Field records with a clearance of 7-7¾ (2.33m) at the Penn Relays. Won the high jump at the Polytan Invitational with a clearance of 7-7 (2.31m). This Season: Won the Texas Relays high jump with a collegiate-leading clearance of 7-6½ (2.30m) in his outdoor debut. Earned 2013 DI National Indoor Field Athlete of the Year honors. Won the NCAA Indoor title in the high jump with a No. 2 all-time collegiate mark and Canadian record of 7-8½ (2.35m) without missing through seven heights. Nearly cleared but missed on three attempts at a collegiate-record 7-9¾ (2.38m) at the Indoor Championships. Cleared a then-nation-leading 7-7¼ (2.32m) in the high jump at the Hoosier Hills Open, good for the tenth-best clearance in collegiate history. Set the all-time world-best in the heptathlon high jump with a clearance of 7-6½ (2.30m). Won the Big Ten title in the high jump with a mark of 7-5 (2.26m) and finished third in the heptathlon (5,817) with the eighth-best collegiate score this season. Has won his past seven indoor high jump events against collegians dating back to the 2011-12 season. This Season: Ran the second-fastest outdoor in-season 5000 in collegiate history with a 13:15.33 at the Payton Jordan Invitational, finishing third in a race filled with professionals and top collegians. Has shown great range in 2013, finishing fifth in his 2013 outdoor debut in the Stanford Invitational 10,000 with a 28:52.73 and seventh in the Mt. SAC Relays 1500 at 3:41.90. Was the NCAA runner-up in the indoor 5000 at 13:30.24 and finished fourth at 3000 meters in 7:49.53. Indoor Big Sky Champion in both the mile and at 3000 meters. Since Last Time: Tied his career-best with a clearance of 7-8 (2.34m) in a win at the Mt. SAC Relays over former world champion Jesse Williams and Canada’s Michael Mason. This Season: Finished runner-up to Drouin at the Texas Relays high jump with a clearance of 7-5¼ (2.27m). Finished third on misses at the NCAA Indoor high jump with a mark of 7-6 (2.29m). Posted a then-collegiate-leading mark of 7-7¾ (2.33m) at the KSU Open, tying his indoor career-best and No. 3 all-time collegiate mark. Has won each of his five events this season and 24 of his past 26 events – indoors and outdoors – against collegians dating back to the 2010-11 season. Claimed the 2013 Big 12 high jump individual title with a mark of 7-7 (2.31m), defeating the field by more than five inches. Has cleared heights of 7-6 or higher in six of his eight events this season. Since Last Time: Debuted at the Arizona-Arizona State-Northern Arizona double dual with wins at 1500 meters in 3:41.52 and at 5000 in 13:40.85 by over a minute. Appears on The Bowerman Watch List for the 14th time, most among all active student-athletes and tied for third all-time with Liberty’s Sam Chalenga. This Season: Earned 2013 DI National Indoor Track Athlete of the Year honors. Completed an NCAA Indoor double championship in the mile and at 3000 meters, both of which were in meet-record fashion: 3:54.74 for the mile and 7:45.94 at 3000 meters. First to complete this double since Bernard Lagat of Washington State in 1999. Ran the third-fastest indoor mile in collegiate history when he finished fifth overall and second among collegians at the Millrose Games with a 3:54.56. Became the third-fastest performer in the 3000 in collegiate history when he clocked a solo 7:42.79 at the Razorback Invitational to win by 15 seconds over the then-No. 2 performer in DI. Since Last Time: Finished runner-up and first among collegians in the 110 hurdles at the UF Tom Jones Memorial in 13.46w (+3.0m/s), giving him the third-fastest qualifying time in the division. Won the 110 hurdles at the Arkansas Team Invitational in 13.72 (+1.1). This Season: Ran a 13.47 (+2.6m/s) in his 2013 outdoor debut at the Texas Relays. Ran the fourth-fastest time in collegiate history at 7.50 en route to an NCAA indoor title in the 60 hurdles, breaking the previous meet record of 7.51 held by Aries Merritt of Tennessee in 2006. Became the third-fastest all-time collegiate performer in the 60 hurdles with the fourth-fastest time. Also ran a 7.53 in the prelims at the NCAA indoors, and a 7.54 at the SEC Championships. Won five of six hurdles events (one at 55 meters) this season, including an SEC title. This Season: Won both the 200 and 400 at the UCLA/USC dual meet, winning at 200 meters in a collegiate-leading 20.37 (+0.9). Won the Florida Relays 400 in a then-collegiate leading 45.54. Finished runner-up and tops among collegians in the Mt. SAC Relays 400 elite in 45.65, making him one of just two 400 meter sprinters to dip under 46 seconds twice this season (David Verburg of George Mason is the other). This Season: Scored a collegiate-leading 8,223 points in his collegiate decathlon debut at the Georgia Bulldog Decathlon, placing him as the No. 8 in-season performer in collegiate history. Showed diversity in winning the discus (161-3/49.14m), the long jump (25-8/7.82m, -1.2m/s), the pole vault (16-2¾/4.95m), and the 1500 (4:30.60). Finished lower than third in just one event. Standing alone, his long jump mark stands as the 11th-best in the division. Finished fourth in the indoor heptathlon at the NCAA Indoor Championships with a score of 5,975, winning the 1000 meter component (2:39.72). Since Last Time: Ran two winning relays (4×100, 4×400) and won the 100 (10.24q/10.42) at the Penn Relays. Won the 100 at the Arkansas John McDonnell Invitational (10.08w, +4.3m/s) and the 200 at the LSU Alumni Gold Invitational (20.59). This Season: Won the Texas Relays 100 in a collegiate-leading 10.14 (+1.6m/s) and won the Oregon Pepsi Team Invitational 200 in 20.74 (+0.8m/s), which is the No. 7 time in DI this outdoor season. Defended his NCAA indoor title at 200 meters with a time of 20.42, after running a 20.37 that made him the eighth-fastest performer in collegiate history. Ran the two fastest times in the collegiate ranks this season with his performances at the NCAA indoor championships. Since Last Time: Now owns the top 20 collegiate throws of the 2013 outdoor season and five of the top 10 collegiate throws all-time. Earned wins at the Mt. SAC Relays (211-9/64.55m), the UCSD Triton Invitational (216-3/65.92m) and the UCLA/USC Dual (214-3/65.31m). This Season: Has thrown three all-time collegiate top-10 marks in the discus in his three meets in 2013, improving with each meet. Won the discus in a dual against LSU/TCU with a mark of 216-8 (66.05m), which is the No. 6 throw in collegiate history. The week prior he launched a 216-7 (66.01m) at the Texas Relays, good for No. 7 all time, and a 215-10 (65.80m), No. 10 all time. Mike Berry JR Oregon Sprints Seattle, Wash.
Jordan Clarke RS SR Arizona State Throws Anchorage, Ala.
Andrew Irwin SO Arkansas Pole Vault Mount Ida, Ark. Kevin Lazas JR Arkansas Combined Events Brentwood, Tenn.
Past winners include Olympic gold medalist and decathlon world-record holder Ashton Eaton (2010), 10,000-meter Olympic silver medalist Galen Rupp (2009), and 2011 IAAF World Champion at 1500 meters, Jenny Simpson (2009).